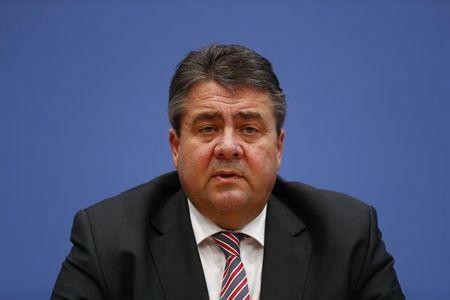 BERLIN (Reuters) - Germany will need a new economic strategy geared toward Asia should the new U.S. administration start a trade war with China, Vice Chancellor Sigmar Gabriel said on Friday, warning against protectionism hours after President Donald Trump was sworn in. "I think we have to prepare for a rough ride," Gabriel said in an interview with the public broadcaster ZDF, in the first official German reaction to Trump's inauguration. He added that Trump's election was the result of "a bad radicalization". The leader of the left-leaning Social Democrats (SPD), coalition partners of Chancellor Angela Merkel's ruling conservatives, dismissed suggestions that Trump may not pursue some controversial promises, such as imposing high tariffs on cars imported from Mexico. "He means it extremely seriously," said Gabriel. "What we heard today were high nationalistic tones." He added that all that was missing from Trump's speech was comparing parliament to a "Quasselbude" or "talking shop," a term used by Hitler before he took power to discredit the parliamentary democracy of the Weimar Republic in the 1920s. Gabriel said the European Union and Germany must stand together "to defend our interests" and to prevent such nationalistic fervor from gripping the continent. Germany will hold a general election in September in which the anti-immigration Alternative for Germany (AfD) party is expected to enter the national parliament for the first time. Trump has criticized Merkel's decision in 2015 to throw open Germany's borders to asylum seekers fleeing wars and conflicts in the Middle East and elsewhere and has said he believes other countries will leave the EU after Britain. Merkel, who had a close relationship with former U.S. president Barack Obama, responded to his comments in a newspaper interview earlier this month by saying that Europe's destiny was in its own hands. The United States is Germany's biggest trading partner and Trump has warned that his administration will impose a border tax of 35 percent on cars that German carmaker BMW plans to build at a new plant in Mexico and export to the U.S. There are fears that a protectionist trade policy by Trump could harm the global economy. A trade war with China would be particularly harmful for Germany, a leading exporting nation that gets nearly half its gross domestic product from exports. "Should the United States start a trade war with China and all of Asia then we as Europeans and Germans are fair partners," Gabriel said. "Europe and Germany need a strategy geared toward Asia and China and we have new opportunities." He added: "We should neither be submissive nor have fear."